After nearly 3 decades since David Hasselhoff and Pamela Anderson slow-mo'd onto our television screens, Baywatch is back with a high-octane comedy that doesn't quite hit the mark. Based on the classic 90s TV show, Baywatch follows Dwayne 'The Rock' Johnson's Mitch Buchannon and his team of almost unbelievably attractive lifeguards. 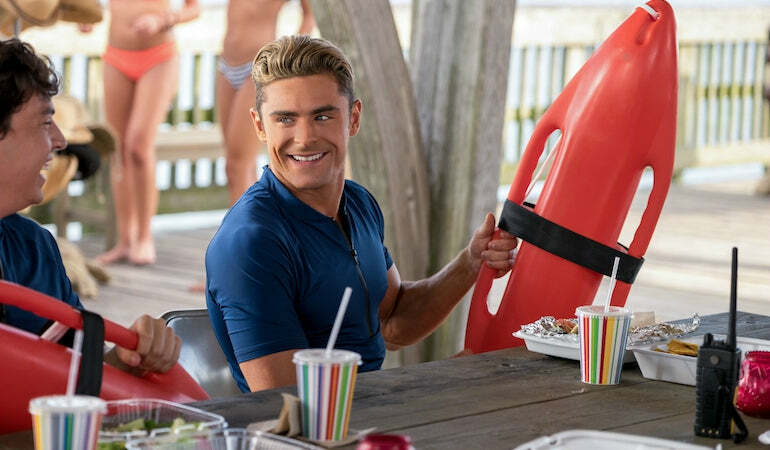 When a cocky ex-Olympic swimmer, played by Zac Efron, tries to join their team they have to band together to stop an organised criminal plot that threatens their bay. If you think that this all sounds a bit ridiculous then you would be right. However, the over the top nature of the film is both its saving grace as well as it's undoing. After the success of other big screen TV reboots, such as 21 Jump Street, there appears to be an attempt by Seth Gordon to give his latest film the same self-deprecating vibe. Although Baywatch begins with a promising first act, and an opening scene that sets the jokey tone perfectly, it finds it hard to sustain the same charm as the film progresses and becomes increasingly plot heavy. Whereas the success of Jump Street came in its witty screenplay that played to the strength of its two lead actors, Baywatch seems to never quite reach the same level. With just enough swear words and cleavage shots shoehorned in to give it a 15 rating, there is a certainly a superficial reliance on cheap gags. However, to say that the film is a disaster would be unfair. Whereas the majority of attention has been paid towards Efron and Johnson, and their Herculean bodies, it is actually the women characters who are the stars of the Baywatch cast. Amongst all the publicity that has surrounded the casting of Indian actress Priyanka Chopra as the main villain instead of a male actor, it's a relief to know that she is a definite breath of fresh air. Yet, this isn't to say that the film's gender politics aren't obviously troubling. "If I was a man you'd say I was driven", says Chopra, in character as Victoria Leeds as she lords herself over a defenceless Zac Efron. This may be true, but a couple of empowering lines of dialogue don't make up for the constant objectification in the rest of the film. Although the supporting cast definitely presents strong female characters, with Kelly Rohrbach, Ilfenesh Hadera and Alexandra Daddario all giving quality performances, it struggles to get away from the pervy pitfalls that made the original TV show so cringy. The most entertaining element of the film is arguably its visual spectacle. As one of the biggest summer blockbusters, and with a huge budget, there is no end of impressive stunts and exciting chase scenes. After the hit and miss nature of many Zac Efron movies, it's also good to see the on-screen chemistry between himself and Dwayne Johnson being engaging enough to keep you chuckling throughout the film. Even if they do get too much screen time towards the end of the movie. Whether you've just come for Dwayne Johnson's body or you're interested in seeing some classic Baywatch costumes, this is exactly what you would expect from a summer blockbuster. Despite not being as troubling as it could be, Baywatch doesn't manage to avoid all of the faults from the TV series. But, if you're looking for an action packed film to go see with your friends on a Sunday afternoon, then this may be perfect. You might even laugh a couple of times.